Vectric has launched new full releases for both Aspire and VCarve Pro, its two main CNC routing software packages, which feature significant changes and enhancements in all areas of the programmes. Taking as its starting point the systems’ most popular tools, Vectric has devised ways making them even more intuitive, resulting in enhancements that improve the general work-flow for both new and existing users. In addition, some major new features were also included, in order to expand the power and scope of each programme. 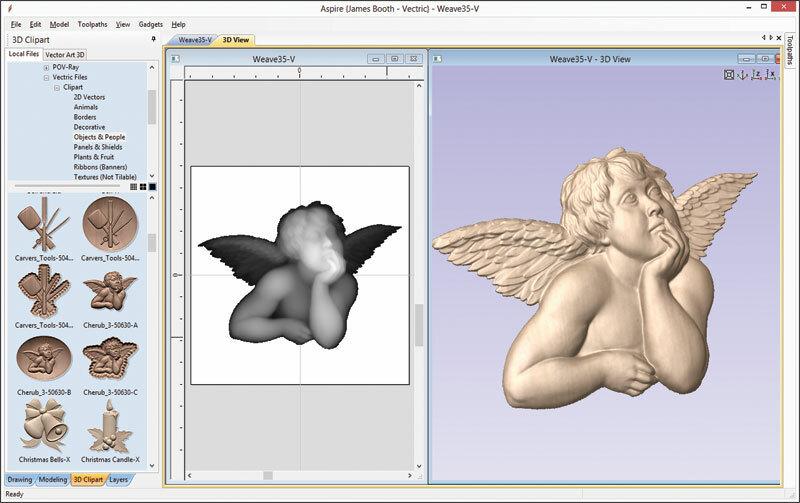 As users will discover, the most noticeable difference with both Aspire 4.0 and VCarve Pro 7.0, is the change to the interface layout, which now features re-organised icons that are more logically placed and they have also benefitted from significant enhancements to the drawing tools, with improvements to snapping helping to speed up the creation or editing of vectors. Many existing features, such as alignment, mirroring, offsetting and arc drawing, have been expanded, while nesting, curve fitting and image to vector conversion all now offer a preview option, which makes it easier to scull through different values in order to quickly optimise the best result. New options, which extend lines to a common intersection point and create simple dimensions for 2D objects, have also been added to the design features. 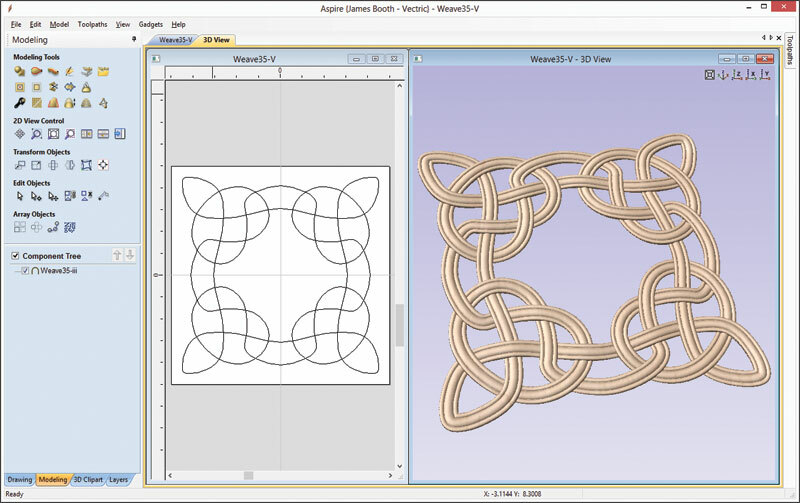 Additionally, there have been a number of big changes to Aspire’s 3D Modeling functions, the most significant of which is a flexible new ‘Extrude and Weave’ tool that enables users to create complex shapes from fairly simple sets of vectors. For example, the Two Rail Sweep tool has been completely overhauled, facilitating the creation of multiple interactively editable cross-sections, thus providing the user with more control of the shape being modeled. There is also a new Add Draft tool for the creation of shapes that can be used for applications such vacuum forming moulds. 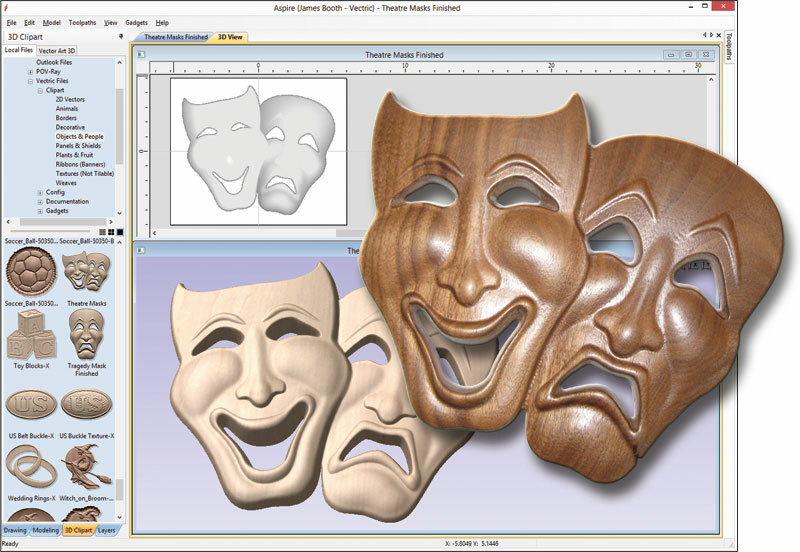 In addition to the new features, there has been a major overhaul and increase in the free 3D Clip Art models supplied with Aspire, providing over 400 individual designs with variants that take the total to over 1000 free models. Further, some of the Clip Art files also contain vector data that enables the user to create alternate versions of items such as borders and weave patterns. When it comes to machining, the focus is on ease of use with new options for previewing the results of a toolpath, enabling the speed of the preview to be adjusted to make it easier to visualise how a part will be cut. 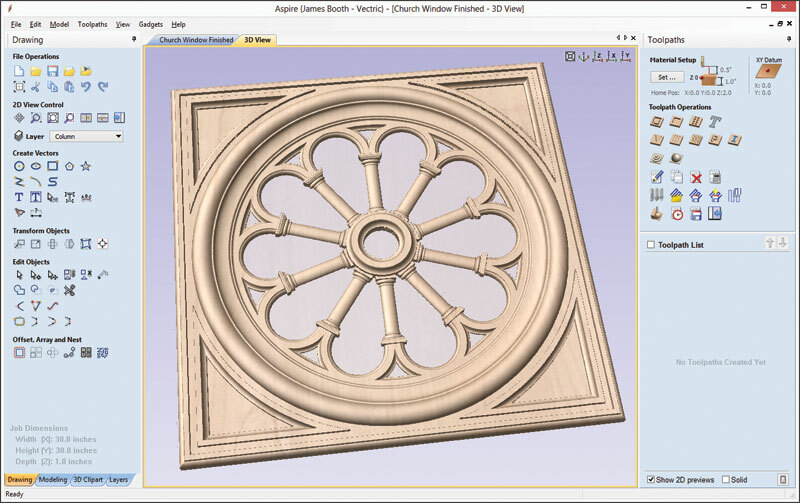 Once the preview has finished, any of the waste areas can be interactively removed from the 3D View, facilitating the creation of a very accurate 3D shaded image of exactly how a part will look when cut. Other general improvements to both packages include more options for dragging and dropping files directly into either programme, plus in the case of Aspire, a direct import for 3DM from the popular Rhino modeling software. The Layer Manager has also been revamped in order to better manage 2D data in both programmes and there is greater support for ‘Gadgets’ thus enabling users with programming ability to create their own custom tools. NextStay calm – wine is here!